Bolboschoenus maritimus is a beautiful quick-growing sedge with golden flower spikelets. It is ideal for planting next to ponds or in a wetland garden. Bolboschoenus maritimus is a rhizomatous (with horizontal stems below ground) perennial reaching 1.2 m in height. It has triangular stems that are sheathed by serrated emerald-green leaves. Each individual plant grows from a corm and then puts out a horizontal rhizome from which the next plant grows. In this way the plant can quickly form dense stands. Flower stems rise above the leaves during summer (October-March) with golden brown, ovoid spikelets clustered just below their tips. The flowers are monoecious (individual flowers are either male or female) but both sexes can be found on the same plant. Shiny brown tear-shaped fruits are produced, each containing one seed. This is a cosmopolitan species and occurs in many places around the world. In South Africa it can be found from the Cape Peninsula northwards. Its preferred habitat is wet marshy flats, seasonal and permanent wetlands, pond margins and estuaries. It usually occurs at an elevation of less than 700 m above sea level. Bolboschoenus maritimus is a member of the Cyperaceae or sedge family. These are usually grass-like plants with culms (stems) which are solid and often triangular. They have leaves with blades and leaf sheaths and their inflorescence is a spikelet held below the tip of the flowering culm. This characteristic sets them apart from true grasses and restios. The genus Bolboschoenus consists of 16 species, one of which occurs in the Western Cape. The genus name originates from the Greek word bolbos meaning an onion or Latin word bulbus meaning bulb (corm) and the Latin word schoenus (Greek schoinos), which means a rush. The Latin specific epithet epithetmaritimus refers to the ability of this plant to thrive in coastal conditions. Bolboschoenus maritimus is quite adaptable as it can survive in both saline and non-saline conditions. 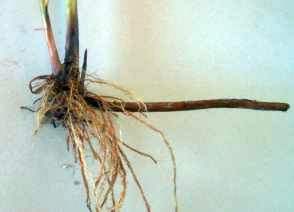 It can handle almost total submersion in water and during dryer times the corms/rhizomes survive by remaining dormant. Like many sedges, B. maritimus is wind-pollinated. The female flowers on the plant mature before the male flowers, preventing self-pollination. Seeds are dispersed by floating on currents to other shores where they eventually sink. Seeds may also be dispersed by certain water birds which feed on them. The rhizomes/corms are eaten by geese and the leafy parts are used as nest building material. These plants also provide cover for water birds and may provide spawning areas and nurseries for fish. The roots or corms of Bolboschoenus maritimus have been used in China as an astringent and as a diuretic. Studies by Michèle Wollstonecroft and Aylan Erkal in 1999 suggest that the seeds and rhizomes can be ground into flour and baked into bread. The leaves have been used for making twined mats, and as the edging of woven mats. They have been used as the warp for sandals as well as warps and twining wefts for making clothing. Bolboschoenus maritimus can be used effectively in the reconstruction, creation and rehabilitation of wetlands; the rhizomes can control erosion by stabilizing soft substrates and providing protection from wind and wave action of newly exposed soil. The rhizomes form a habitat for beneficial bacteria that give these plants excellent water-filtering properties. Bolboschoenus maritimus can be grown in most soils as long as they are kept quite wet. This is an excellent plant for a wetland garden or at the edge of a pond. It can also be planted in shallow water. 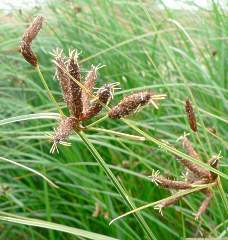 As this sedge can withstand alkaline and saline conditions, it is ideal for a coastal garden where many other plants won't survive. Plant the corms/rhizomes about 20 cm below the soil surface in a sunny position. 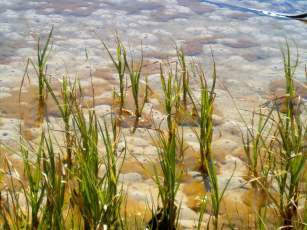 Plant Bolboschoenus alongside other sedges such as Juncus kraussii and Scirpus nodosus and restios such as Chondropetalum nudum. Young healthy plants can be lifted and the rhizomes divided into sections. Care must be taken that at least one viable bud is kept on each section. Larger divisions can be transplanted immediately into their new locations. Smaller divisions should be potted up and grown in a lightly shaded position until established. To grow these plants from seed, collect seed in late summer to autumn. The seeds are held quite tightly in the seed head giving the collector quite a bit of leeway. Collect the seeds by hand, stripping the spikelets from the plant. In North America and the UK seeds are pre-chilled for 30 days at 1-3ºC in a mixture of sphagnum moss and distilled water. This may not be necessary in all areas. Sow the seed in a pot standing in 3 cm of water. Press the seed into the soil to ensure good contact but do not cover, as these seeds require light to germinate. Place in a cold frame and keep moist. Ideal germination temperatures are 25-35ºC during the day dropping about 5ºC lower at night. Germination should take place after one to two weeks. Keep the small plants moist until they are ready to transplant. They can then be pricked out into larger pots. Trinder-Smith, T.H. 2003. 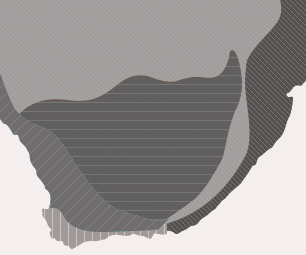 The Levyns guide to the plant genera of the southwestern Cape. Bolus Herbarium, University of Cape Town. Wollstonecroft, M. & Erkal, A. 2003. Summary of plant processing experiments at Çatalhöyük, August 1999. Çatalhöyük Research Project and individual authors. Interagency, Riparian/Wetland Project. 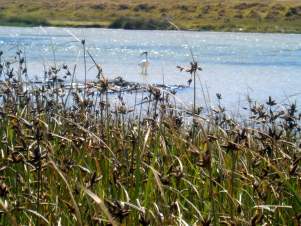 Alkali bulrush (Scirpus maritimus) Wetland Fact Sheet. USDA-NRCS, Plant Materials Centre, Aberdeen, Idaho, USA. Kantrud, H.A. 1996. The alkali (Scirpus maritimus L. ) and saltmarsh (S. robustus Pursh ) bulrushes: a literature review. National Biological Service, Information and Technology Report 6. Northern Prairie Wildlife Research Centre Online, Jamestown, ND, USA. Hoag, C.J., Wyman, S.K., Bentrup, G., Holzworth, L., Ogle, D.G., Carleton, J., Berg, F. & Leinard, B. 2001. Users guide to description, propagation and establishment of wetland plant species and grasses for riparian areas in the Intermountain West. Technical Note, TN Plant Materials No. 38. USDA-Natural Resources Conservation Service, USA.